Ida was a lemur-like mammal that roamed central Europe about 47 million years ago. She died at a relatively young age of 9 months, on the banks of the volcanic Lake Messel in modern-day Germany. The circumstances of her death play a large part in her current fame – researchers involved in the find speculate that Ida was overwhelmed by a belch of carbon dioxide gas from the lake, causing her to slip into the oxygen-deprived lake. The unique concoction of Messel’s volcanic water coupled with the lack of trauma to her body meant that Ida’s corpse was preserved almost perfectly preserved within the lake bed, gradually fossilizing over millions of years. In 1983, Ida’s fossilized remains were resurrected but the significance of this find only came to light in the past week. Ida is remarkable because her fossilized skeleton is almost 95% complete. It includes almost every bone, fur, and even Ida’s final meal – fruit and leaves. 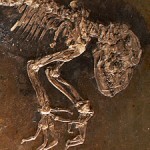 In the past, similar fossils have been found but none so exquisitely preserved. Ida’s almost fully intact frame allows researchers to address questions that have frustrated them for decades. In particular, it offers some intriguing clues to human origins. She dates from a time when primates split into two branches – anthropoids, whose descendants include humans, apes, and monkeys, and prosimians, whose descendants include lemurs. Ida has characteristics of both groups, and may hold the key to a shared lineage. A commonly-held view among paleontologists is that anthropoids (and therefore humans) evolved from Eosimias, whose fossilized remains have been dated to 45 million years ago. Jørn Hurum of the Natural History Museum of the University of Oslo and Philip Gingerich of the University of Michigan, Ann Arbor, the main players in the Ida discovery, do not agree. Hurum and Gingerich believe that anthropoids arose from a more primitive group of primates called adapids. Ida has a number of features not found in lemurs – namely a grooming claw on her second toe and front teeth arranged into a toothcomb. Furthermore, Ida’s front teeth and ankle resemble the anthropoid branch of primates. Together, these features suggest that adapids link primitive primates and anthropoids, and therefore the lineage leading to humans. Many paleontologists are skeptical, however. Science magazine points out that Hurum and Gingerich’s analysis examined only 30 traits, where standard practice is to compare 200 to 400 traits. They quote Richard Kay, of Duke University, who says “There is no phylogenetic analysis to support the claims, and the data is cherry-picked. Many in the science community have rolled their eyes at the manner of the announcement, which included an international press conference, publication of a book, and exclusive prime-time television special documentary. Hurum’s suggestion that “Any pop band is doing the same thing” did little to allay the criticism. Ultimately, Ida is an important fossil and will doubtless shed considerable light on human origins. At the same time, the media blitz that accompanied the announcement seems to have tainted its significance and put critics on the offensive. Ida has changed some things – namely the debate about whether anthropoids come from the suborder strepsirrhinae or the suborder haplorrhinae. The “scientific find that will change everything”? Possibly not. Print article This entry was posted by connolly on May 26, 2009 at 1:20 pm, and is filed under G2C Online. Follow any responses to this post through RSS 2.0. You can skip to the end and leave a response. Pinging is currently not allowed.